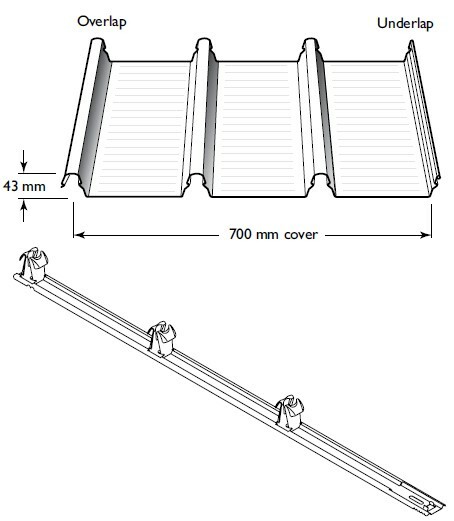 LYSAGHT KLIP-LOK 700 HI-STRENGTH® has excellent spanning capacity due to its improved rib strength. The KLIP-LOK clips are designed to enable thermal expansion of straight, long runs that will look crisp and clean whilst providing excellent water carrying capacity. It has superb weatherproof performance as there are no piercings through the cladding. KLIP-LOK 700 HI-STRENGTH® can be used for both roofing and wall cladding applications. Can be used with the LOK-KLIP® end and expansion joint system. It is available in the full range of COLORBOND® steel colours and in unpainted ZINCALUME® steel. Click on the link for full product description, specifications and features for LYSAGHT KLIP LOK 700 HI-STRENGTH®.